The Miyela community has taken the challenge to make South Africa’s first national Spelling Bee a reality. The Spelling Bee is taking flight. And that’s exciting. But let’s always keep in mind why we are having a Spelling Bee. Why we want our kids to get into competition with words. We are a collective dedicated to the fact that individuals can make a difference. Miyela believes that real power is in the heart of the individual who is aware and moved by their own potential. We have often complained about the state of education. Often we have directed our wrath at the government. Why aren’t they doing this? Why do they not do this?! But we know in the end that that is not what we are about. When we wait for the state to give us all the answers, we loose out power. So we are inviting you to help us claim our power and our ability to make things happen for the better. We challenge the Miyela community to get involved in our various initiatives to change education for the better. Come and join us at Naledi High School in Soweto and tutor Grade 11s and 12s as they prepare to live their lives out of school. 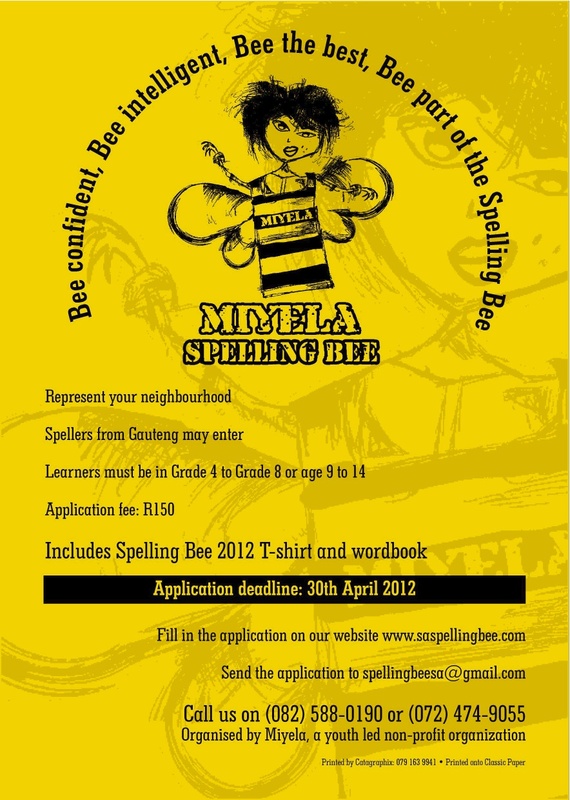 Be a part of the Spelling Bee and tutor the younger generation as they try to be brilliant at something. It is not about what. It’s about why. So make a plan to contribute to your world in the way you think is most valuable and thrilling.